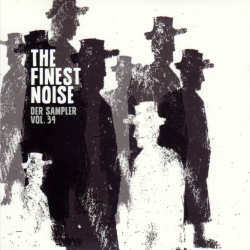 About every six months, German record label The Finest Noise releases a compilation that one can order for free, featuring mostly bands from Germany that play some or any kind of rock music. Most of the artists are still unsigned and try to get some exposition that way. The latest instalment is number 34, showing that the tradition of these compilations is already nearly two decades old. As there are hardly any stylistic limitations, these compilations are always very varied, so that there should be something for everyone, although I doubt that you will find many people that will like all of the featured artists. For instance I was rather disappointed by the last two compilations as too many of the bands were shying away from any risk taking and tried instead to copy current trends. Fortunately things look brighter on the new edition, and even though not everyone’s a winner, there are a lot of good bands that deserve to be discovered. A good opener comes with Sir Collapse who play timeless stoner sludge rock. Maggie On The Roxx offer competent pop with smooth jazz parts, for my taste a little too slick though. Next up are the awful Gentlemen’s Descent whose Nickelback clone rock just doesn’t want to appeal. Perfect indie rock with cool retro organ sounds comes next from Kornelius Flowers, whose latest solo album is very recommendable. The Jooles play similar music with their soul and blues infused vintage pop. Soulhenge from Luxembourg play progressive metalcore in a most spectacular way. Infinight are into American flavoured power metal that could have taken advantage of a more powerful production. Arise From The Fallen play quite lively metalcore full of energy and excellent vocal parts. This is continued with some punk by Dr Muller who definitely know all albums by Die Kassierer. Paranoya have been around since the mid-Nineties and play songs with a certain EA80 flair. Fro-Tee Slips also prove that you can have a lot of fun with a limited set of chords. After this triple punk attack, things quiet down with Friedrich Jr who does without electric amplification, and Marius Stärk with this semi-acoustic rock music. More rocking us Lane with Eighties flavoured US rock. Lichtscheu try and fail at channelling Doro’s music, but let’s face it: the Grande Dame of German metal is unique. Open Parachine are deeply into Muse but are eventually overdoing it. A final highlight comes from Sedna and MakeMake’s great noise rock, before Vacek City end the compilation with their blues music in a rather weary way. If you want to hear more of these bands, you can get the compilation for free from the label (you just have to add return postage). The more digital inclined listeners can also find the bands on their respective sites on Spotify, Bandcamp and YouTube.